I love granola! It’s versatile, filling, and when made properly, very nutritious. Today, I’m going to walk you through my homemade granola formula that is low in sugar, fat, and sodium, and free from high fructose corn syrup and preservatives found in many packaged varieties. 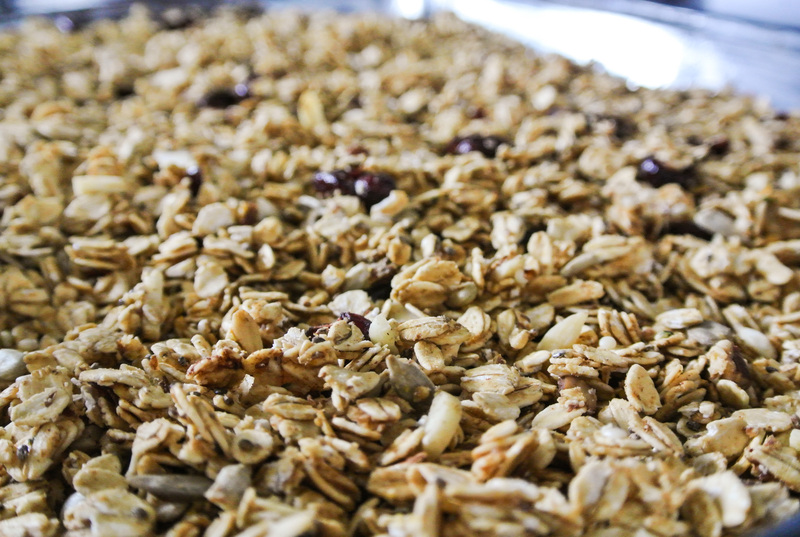 The staple ingredient of granola is rolled oats. Oats are among the first foods a baby can eat and I figure, if they’re safe for a six-month-old who’s trying food for the first time, they’ve gotta be some really good-for-you stuff. Oats contain more dietary fiber than any other grain and even have cholesterol-lowering properties. Given my history with battling hereditary high cholesterol, I’ve always been in when it comes to this super food. 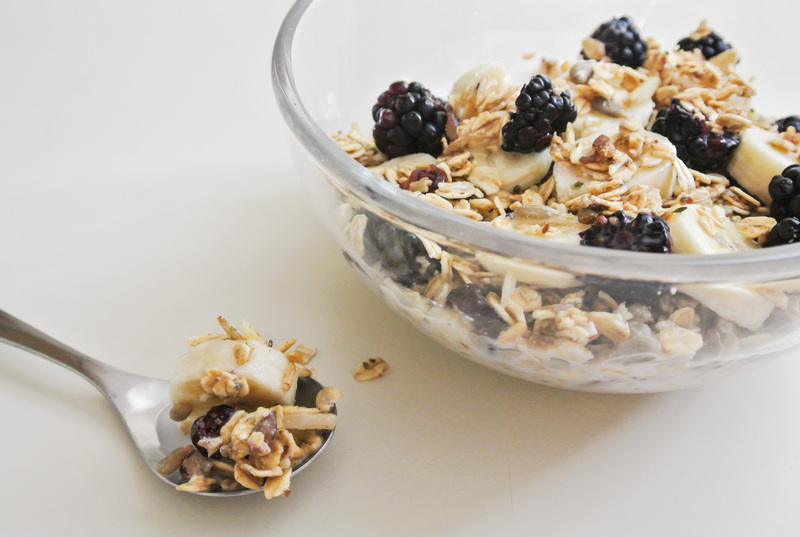 Of all of the different types of oats out there, granola comes together best with rolled. 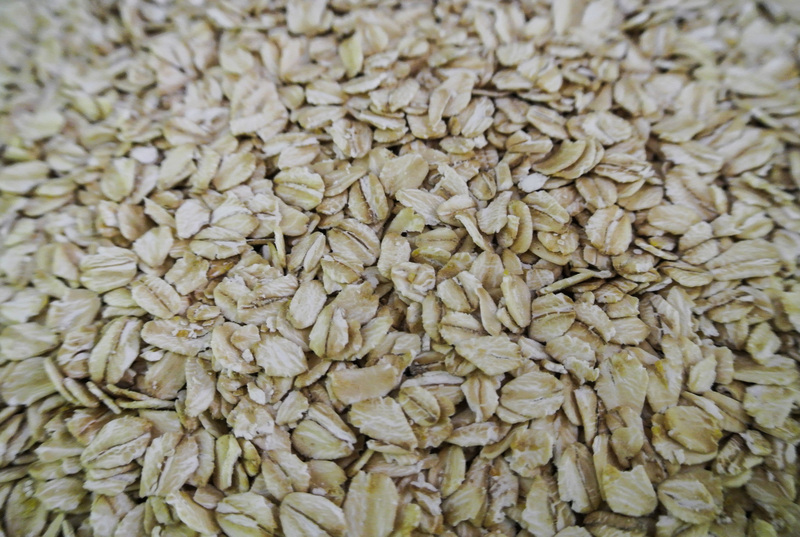 Rolled oats are whole grain oats that have been steamed and pressed. They retain more texture in many kitchen applications than instant oats and cook faster than steel-cut oats (which I also love). I buy them in bulk and always have some in my pantry for a quick oatmeal. In today’s granola, I’m also using raw sunflower seeds. Their flavor is mild and texture crunchy, but easy to chew; Nolan will eat a whole pile of them as is. 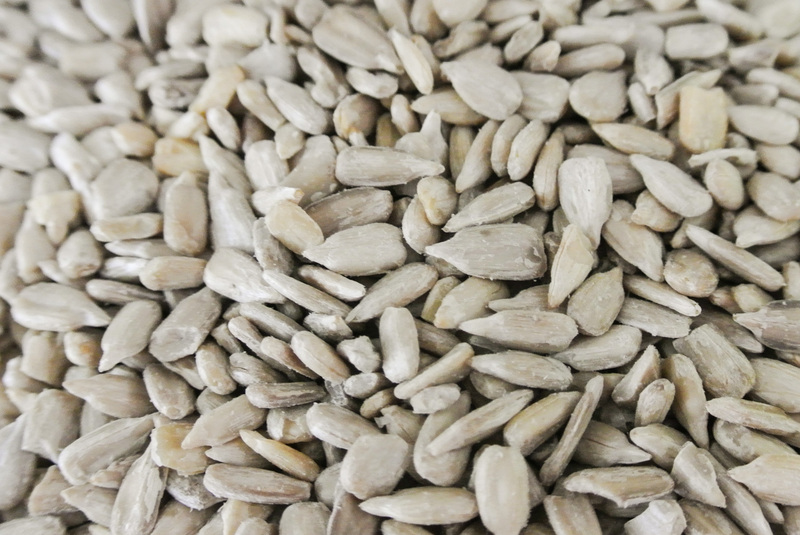 Sunflower seeds are rich in Vitamins E and B-1 and copper, which benefits skin and hair. In addition, if you’ve got a nut allergy, you can buy sunflower butter as an alternative to peanut, almond, or cashew. Before you get into making this breakfast formula, you should know that on its own, it is not very sweet. The low sugar content doesn’t bother me one bit since I never eat my granola without fresh fruit on top or with togurt, but you could always add more dried fruit if you want to take the sweetness up a notch. With very little exposure to sweets in his young life, Nolan is perfectly content eating this granola with just plant milk. A couple more notes… If you don’t have all of these seeds on hand, no worries; you can make the granola without, it just won’t be as nutrient-packed. And finally, whenever possible, make your own juice to avoid preservatives and added sugar. Enjoy! 1 cup dried fruit*, raw nuts, and/or raw seeds –> I’m using a combination of sunflower seeds, dried cherries, dried cranberries, almonds, and pecans. 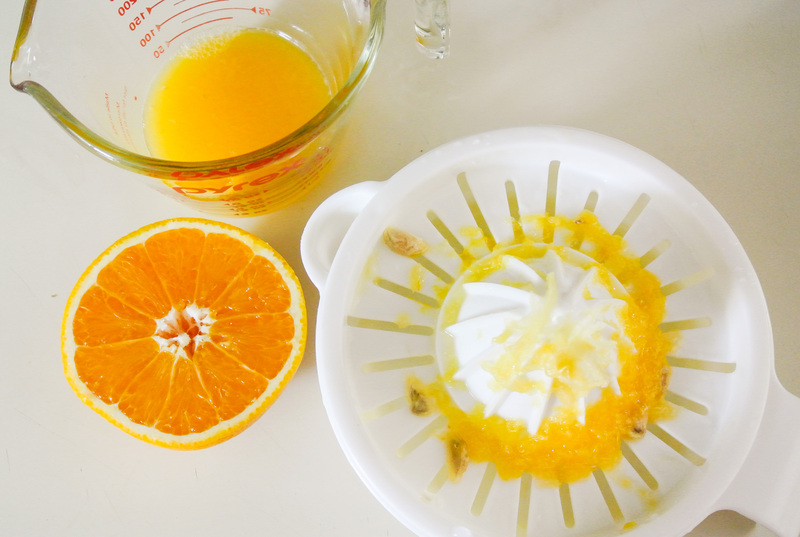 1 cup 100% fruit juice –> I’m using fresh-squeezed orange (2) and grapefruit (1/2). 1 heaping tbsp nut butter –> I’m using peanut. 2 tbsp sweetener –> I’m using agave syrup. Oil enough to grease a cookie sheet or baking dish –> I’m using coconut oil to grease a 9 x 13 glass baking dish as it is easier to stir the granola. *Whenever possible, if you do not dehydrate your own fruit, look for dried fruit that contains little to no added oil or sugar. Also avoid dried fruit that contains sulfur dioxide, as it is not allergy-friendly. See my trail mix post for more info. Preheat your oven to 325 degrees. 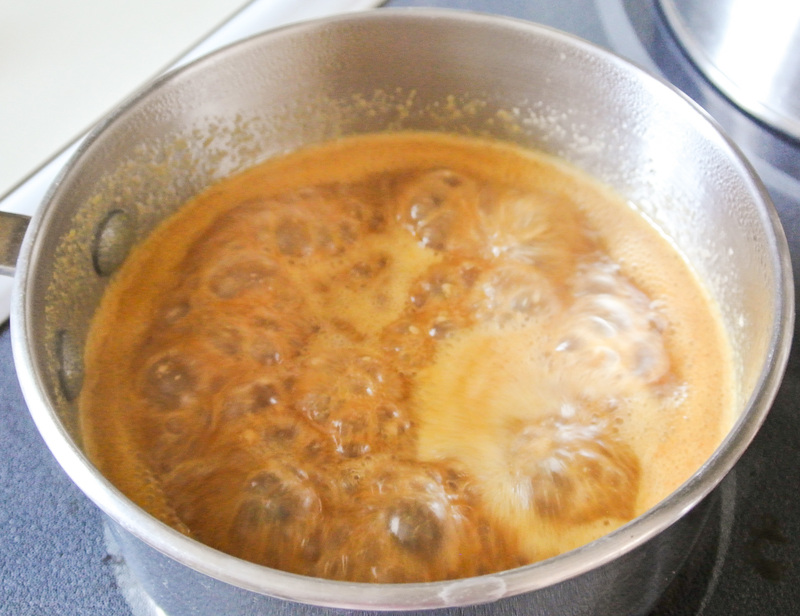 Combine juice, nut butter, sweetener, and cinnamon in a saucepan over medium heat. Once it begins to bubble, turn the heat down to low and let thicken for about 15 minutes. While what I call “the sticky” simmers, finely chop your dried fruit/seeds/nuts, if necessary, and combine with the oats and seeds in a large bowl. When the sticky is ready, slowly incorporate it into the oat mixture as you stir. Spread evenly on a lightly greased cookie sheet or in a lightly greased baking sheet. Bake for 30-35 minutes – or until granola is crunchy and golden brown – turning every ten minutes or so. Let cool completely and store in a tightly sealed container in the pantry. Want to make granola bars? Try doubling “the sticky” and spread the complete mixture onto parchment paper. Bake at least 20 minutes, or until golden brown. This looks so good. I love granola, but rarely buy it since it can be so unhealthy. This is a great healthy recipe. Thanks so much for sharing!